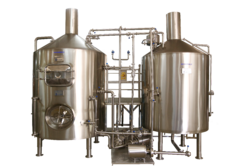 Manufacturer of a wide range of products which include brewery equipment, microbrewery equipment, pub brewery equipment, brewery plants, pub and restaurant beer brewing equipment and brew house. 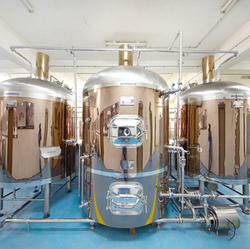 Our microbrewery has state-of-the-art equipment manufactured entirely from stainless steel. Once brewed, 2 batches of unfermented beer are transferred to cylindrical- conical unitanks to ferment and mature. To preserve as much flavor as possible we do not pasteurize our beer, but instead use unique sterile filtration processes. Before being packed our brews are filtered several times through pore filters, ensuring our beer reaches the pub in perfect condition. We would soon be starting guided tours of our microbrewery. Canadian Clear offers start to end solution to clients from visualizing the project to validating, financial and sales models along with installation, commissioning and training of your staff. 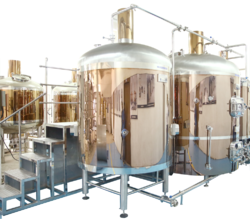 With four decades in providing custom made solution's for various process industries, Canadian Clear guarantees the client high efficiency and consistent quality in the beer produced in its equipments. 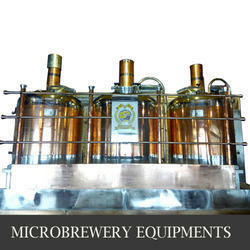 Canadian Clear provides you with a wide range of micro brewery equipments. The variations are in aesthetics as well as manual/semi-automatic or automatic. Our brewery equipment (with daily brewing capacity from 150 litres to 2500 litres) are produced by our manufacturers as per our design and under our supervision. The equipment are manufactured and installed as per the space availability and hence it can be installed anywhere. Through the use of state of the art technologies in design, engineering, and fabrication, we offer complete services from project conception to beer production. 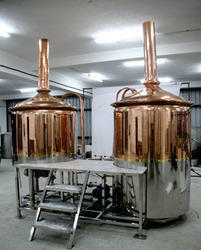 Hotel beer brewing equipment is a good choice for shop, barbecue, restaurant, who brew beer for the customer at scene. The luxury shape, small space demanded, no only has the ornamental value, but also can show the whole process of the brewing to the customer, let them learn the deep cultural connotation of beer. The characteristics of this equipment are: fabrication at scene, maintain the freshness and nutrition maximum. Rich in 17 kinds of amino acids, 8 essential amino acids to human but can not synthesized by ourselves and more than 11 kinds of vitamins, especially B vitamins that rare in other foods, besides, brewer can also brew red beer , yellow beer, fruit beer, black beer, to meet different taste and level of customer. Since the early 1990’s, our engineers have developed the CG series hotel beer equipment, the output is from 100L to 2000L. A total of four series, more than 20 specifications. The CG series equipment are always achieved advanced level in the world. In April, 2004, we began to put the five generation PLC touch- Screen control system to the market. Its stable capability, simple operation, highly improved the control capacity, not only ensure the excellent quality of the beer and pure taste, but also saved the unnecessary management cost. At present, we have developed the six generation long- distance control system. This system uses the internet web to remote control break the time and space constraints, anytime, anywhere provide you the most safe, stable service though technical support, eventually realized the seamless service. At present, this kind of equipment is widespread in most of the cities of China as the excellent quality, reasonable price, value- Added services. So that the common people of China can enjoyed pure whole wheat beer from Germany. 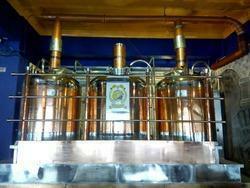 We are engaged in manufacturing, exporting and supplying highly efficient House Brew. The offered beer plant is specifically designed for Pubs and Restaurants using high grade components and revolutionary technology. This State of the art house brew brewing technology promises higher profits with lower costs while respecting and addressing today’s environmental challenges. Besides, our offered beer plant provides fresh naturally carbonated beer and can be availed in various specifications at reasonable prices. House Brew works as an all-in-one single step fermenter, conditioning vessel, and Chiller. 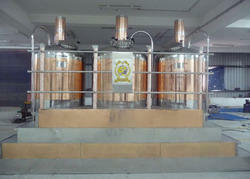 It is a beer brewing method designed and engineered by professional brewers who understand the science of brewing. 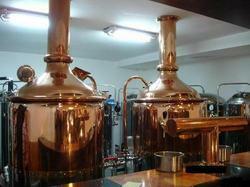 They have formulated the preparation of The beer Mixes for those who want to make beer in pubs & restaurants. beer is brewed quickly and without need of further preparation other than the addition of water in a computerized vessel that is completely airtight and protected from outside environmental influences. House Brew is a revolutionary technology make beer right in the pub. You don’t need a stadium-sized plant that eats a river of rocky mountain water to brew beer . And you don’t need beakers, tubes, a room full of gauges, and three painful weeks to make beer . No need of complicated systems like boilers, grinders etc. We offers its customers a complete brewing solution ranging from water treatments enabling production of the most suitable water for brewing, customized equipment design, planning, structural compliance requirements, process control management systems, brewing training, maintenance support, and Effluent treatment systems meeting Environmental Pollution control norms. Whether you are setting up a microbrewery from scratch, or looking to upgrade your existing Micro Brewery equipment, Prodeb has the solution for you. Canadian Crystalline manufactures the cooling side equipments like tanks for fermentation, cooling and storage, whereas the entire high-tech machinery park, such as the brew house, its controls, heating system, malt mill and some other critical components will still be manufactured. We can supply breweries plant from 5 HL to 130000 HL. The plant can be supplied with semi automatic to full automatic plant. We are ready to offer you consultancy, supply of machineries, erection commissioning and training. Prodeb brewery Belgium technology brings to you not only process technology and equipments but also franchisee of internationals renowned Belgium brands. Prodeb brewery is a one stop shop for your micro brewery to be a success. Prodeb brewery offers start to end solution to clients from visualizing the project to validating, financial and sales models along with installation, commissioning and training of your staff with four decades in providing custom made solution's for various process industries, Prodeb brewery guarantees the client high efficiency and consistent quality in the beer produced in its equipments.